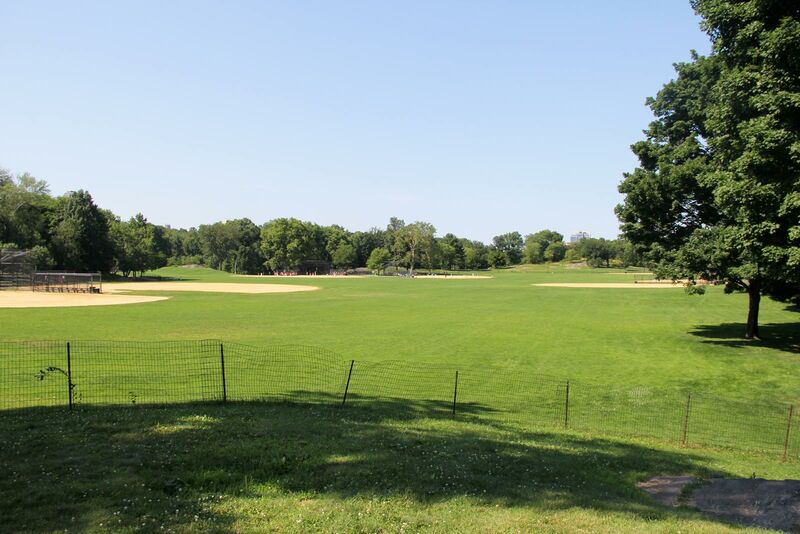 The Park Department's new plan for the construction of fifteen baseball diamonds in Central Park was announced today. 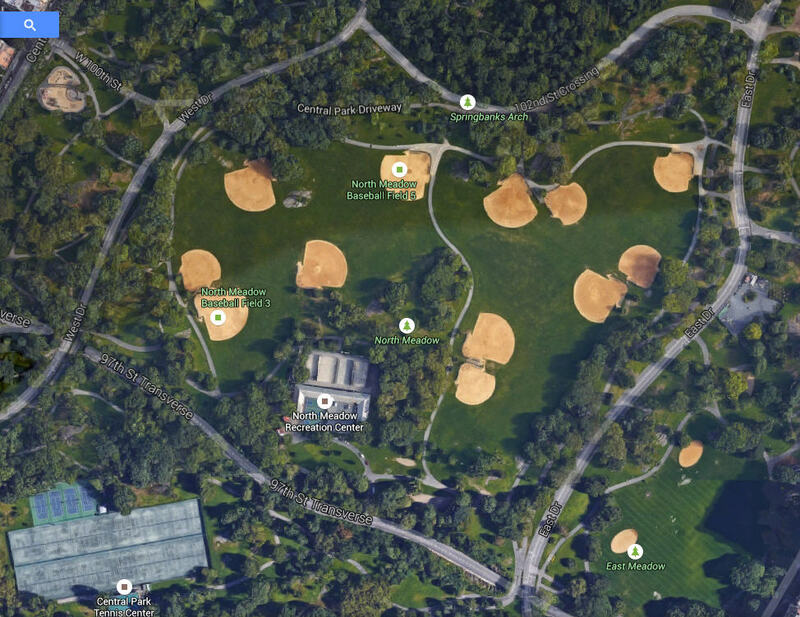 These fifteen baseball diamonds have been laid out in the North Meadow opposite 100th street in Central Park. Up to now the playing of baseball has been permitted in this area but no formal diamonds were provided and conditions have been disorderly and unsatisfactory, thirteen of the new diamonds will be usable now, but two will not be available for immediate play, due to rock which must be blasted away to level off the surface. Base lines have been marked out with lime as on major league baseball diamonds. Regular rubber home plates are being installed and najor league canvas bags will be secured in place to mark the bases. Temporary heavy wire backstops are being installed. Permanent backstops would necessitate a delay in the immediate use of these areas. These diamonds are laid out to provide safe play for all teams using the grounds. Adequate space is provided for spectators. Football and soccer will be provided for after the baseball season. The old stable and storage yard, which has been in use since the Civil War, is being converted into a modern field house. The Park Departnent's horses quartered in these stables will be moved out of the park, showers and locker rooms will be installed in this building, The structure is of good design and is readily adaptable to the plan, the storage yard in the rear of the old stable, which has been used for fifty years as a dumping ground for refuse and discarded equipment, will be turned over to recreation. Handball courts will be built on the site of the old yard. The wall surrounding the old storage yard will be demolished. Access to the new field house for recreation in Central Park will be provided from the 97th street Transverse Road and from the Park path system which encircles this area. The connecting drive between the east and west park roads, opposite 102nd Street, has been closed to vehicular traffic and this area has been turned over to roller skating. The circular overlook on the west side of the park, opposite 105th street, has been converted into a roller skating rink. The Area in the center of the roller skating rink has been set aside for lawn croquet and roque, while the area around the rink has been reserved for other lawn sports. A new playground for small children is also being built adjacent to the roller skating circle. The new facilities being added to Central Park are adjacent to the tennis courts across the Transverse Road in the South Meadow. The Park Department also has set aside twenty-three restricted small plots, adjacent to all of the pedestrian entrances to Central Park, for children under five years of age, in which to dig with their shovels and pails. Sand boxes are provided for this purpose. New York City Parks Department press release of May 17, 1934.